Beautifully piped Chocolate Vanilla Swirl Frosting on homemade Chocolate Cupcakes. Add the broken waffle cone to look like ice cream, but it tastes like a delicious creamy buttercream frosting! Ice cream. We all love it, right? And who doesn’t love getting a zebra or twist cone? A beautiful swirl of chocolate and vanilla?! Today’s creamy Chocolate Vanilla Swirl Buttercream Frosting recipe is my take on that classic ice cream flavor in frosting form! 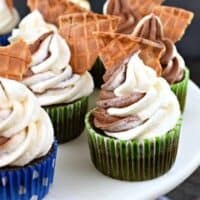 This sweet, swirled buttercream frosting is delicious, especially when paired with my favorite chocolate cupcake recipe! First start by baking a batch of your favorite chocolate cupcakes. If you want to use a box mix, go for it. 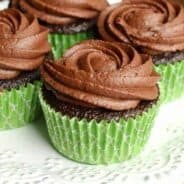 I love this homemade Chocolate Cupcake recipe! Allow your cupcakes to cool completely. Start with a softened, unsalted butter. This allows you to whip it up nice and fluffy, and you’ll be able to easily pipe it through any decorator bag and tip! So now you have separate bags for your vanilla and chocolate frosting, you will want to stuff both bags into a LARGE decorator bag. These can be disposable or re-usable bags. For the tip, I use Wilton 1M, this reminds me of a soft serve swirl ice cream! Feel free to use YOUR favorite tip! To create the swirl with the 1M swirl piping tip, start with the tip on the outside edge of the cupcake with the piping bag held straight up. Squeeze and begin the swirl around the outside edge of the cupcake. Continue squeezing while you create another layer of frosting as you spiral towards the center. 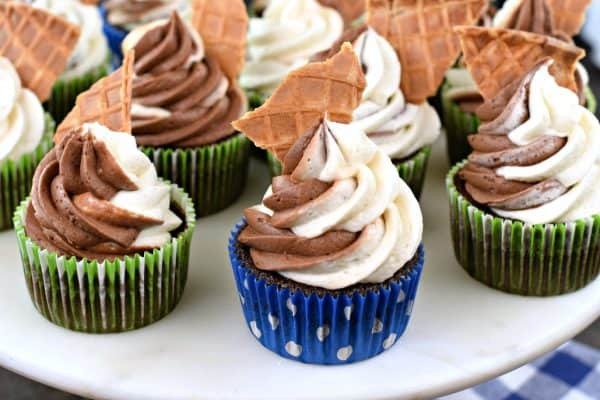 I topped my Chocolate Vanilla Swirl Frosting cupcakes with a broken piece of waffle cone. 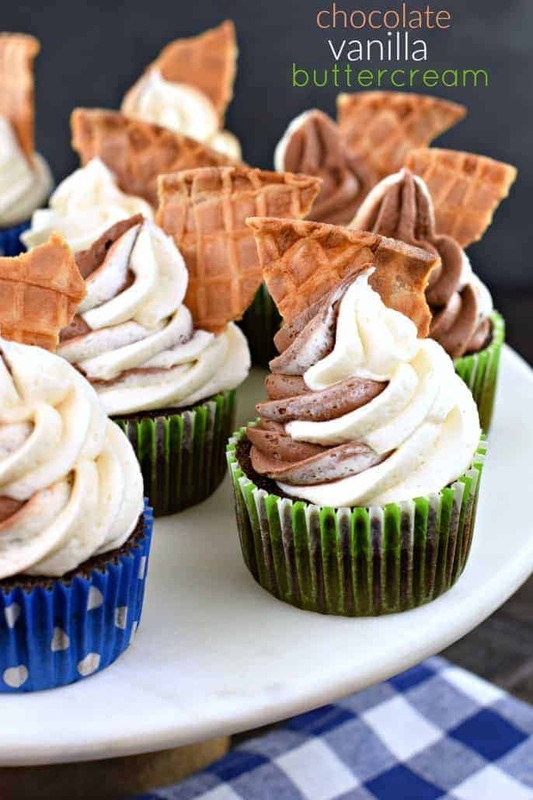 It really gave these gorgeous cupcakes the feel of eating an ice cream cone. I hope you love them as much as I do! 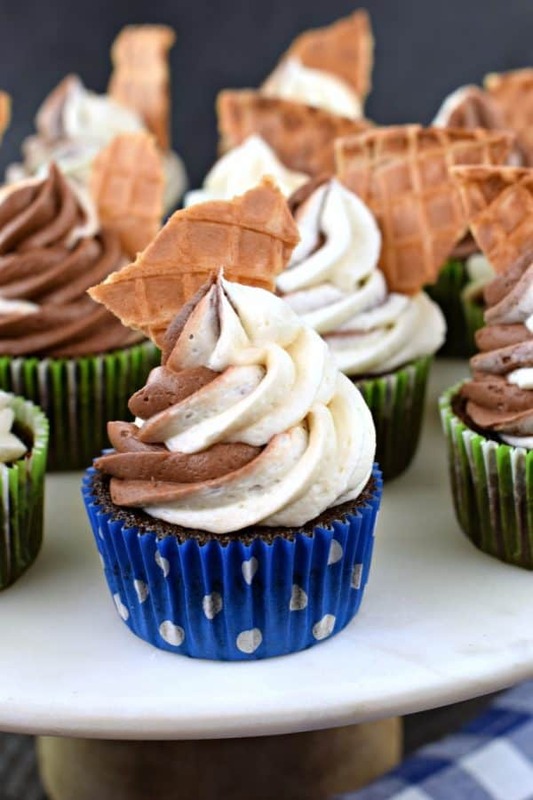 These Hot Fudge Sundae Cupcakes are a fun twist on a classic ice cream treat! This creamy Butterfinger frosting is out of this world! 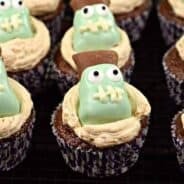 Not only are the Frankenstein’s cute, but they taste amazing too! This Cinnamon Honey Buttercream Frosting Recipe from Amy is the perfect compliment to any cake, especially spiced cakes like, Carrot Cake, Gingerbread or Sweet Potato Cake. 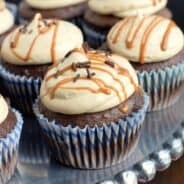 Look no further for the perfect keto chocolate buttercream frosting. 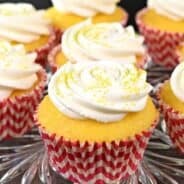 Carolyn created this creamy, low carb frosting, perfect for all your low carb cakes, cupcakes, cookies, and brownies! If you love spice cakes, then you’ve got to top them with this Cinnamon Buttercream frosting! 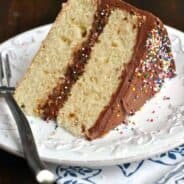 I’ve also shared my favorite, from scratch, spice cake recipe! Prepare cupcakes according to recipe (or box mix). Cool completely. For the vanilla frosting, beat butter in an electric mixer for 3-5 minutes, until fluffy and pale in color. Add in powdered sugar, milk and vanilla. Beat an additional 3-5 minutes until frosting is fluffy, and desired consistency. Set aside. For the chocolate frosting, beat butter in an electric for 3-5 minutes until fluffy and pale in color. Add in powdered sugar, milk, cocoa powder, and chocolate syrup. Beat an additional 3-5 minutes until frosting is fluffy, and desired consistency. Set aside. Spoon each frosting into a separate piping bag (no tip). Snip off the tips of the bags. Add both bags to a large decorator bag with a Wilton 1M tip attached. Using a constant pressure, pipe on the outside edge of the cupcake with the piping bag held straight up. Squeeze and begin the swirl around the outside edge of the cupcake. Continue squeezing while you create another layer of frosting as you spiral towards the center. 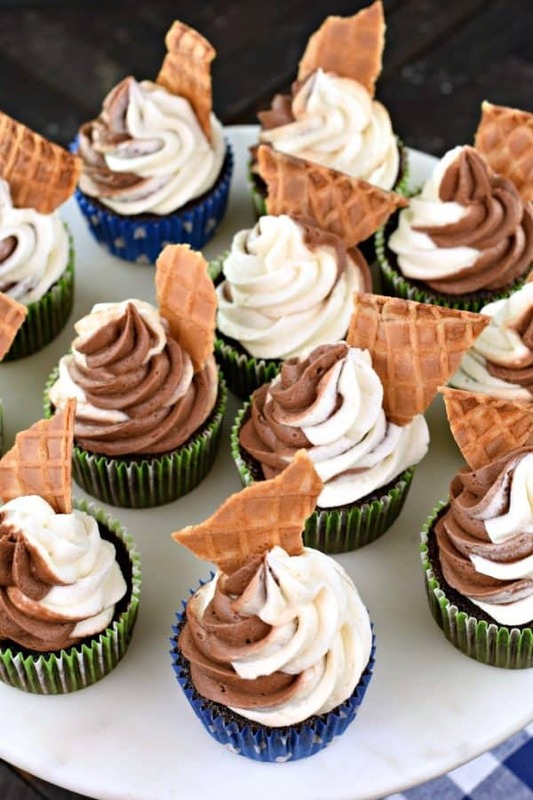 Add your piece of waffle cone to the top and repeat with the remaining cupcakes. Store cupcakes in airtight container for up to 3 days. ENJOY! **frosting recipe makes enough frosting to pipe large swirls of frosting onto cupcakes. If you don't like as much frosting as pictured, cut recipe in half! Enjoy. Tastes *almost* as good as ice cream 😉 But, no melting! Wow! This looks yummy! Can I make it the day before a party? Does it need to be refrigerated?